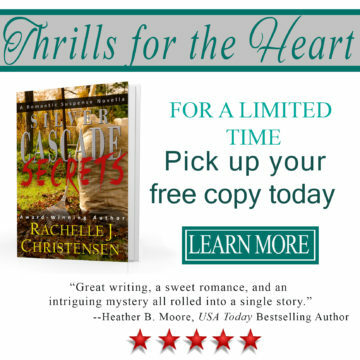 In this romantic suspense novella, SILVER CASCADE SECRETS, by Rachelle J. Christensen, Jillian is the master landscaper at a beautiful park. Meeting Travis there soon after breaking up with her boyfriend, Jillian is wary at first. Travis seems like a great guy, but Jillian had fallen for great guys before. When she learns that his brother, Craig, was murdered six months before, her heart goes out to Travis. True to her curious nature, she starts asking questions and learns about Craig’s close connection with the park. But finding the answers puts Jillian’s life in danger, and she must decide who she really trusts.